Why take a walking adventure? Walking Adventures International (WAI) is a small travel company based in Vancouver, Washington. We are dedicated to providing meaningful experiences around the world. We promote lifelong learning and provide a superior, customized product with a focus on customer service. 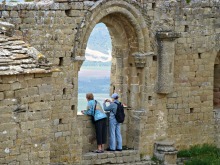 Many of our clients keep coming back; any given tour is comprised of at least 50% repeat travelers. WAI creates each tour from scratch! We do not purchase pre-packaged programs from other travel companies. New trips involve months of planning, including on-site research to plan walks, review hotels, and handcraft the schedule for each day. Subsequent editions of these trips are refreshed with research from our office and collaboration with in-country guides and suppliers. We send two WAI tour leaders on each trip. International trips also benefit from in-country guides. Typically a national guide is with the group from the time they arrive until the day they depart. Local guides also make cameo appearances to add commentary and share insights. We’re convinced that walking is the best way to see the world. We love nature walks and off the beaten path experiences, but great cities of the world have much to share as well. We blend sightseeing and educational excursions in urban settings, traditional and cultural connections in rural areas, as well as natural wonders of the great outdoors to provide a holistic understanding of our destination. We cover the globe—all 7 continents! But every year we offer a different menu of tours based upon client input. Thus, each year the schedule is full of fresh travel experiences. This adds an element of customization—each tour is refreshed and revisited every time we travel. The traveler benefits from our expertise, our past experience, and the invaluable input of our in-country guides and suppliers. But because each trip is essentially a new tour, it doesn’t feel canned or scripted. Authenticity is one of our core travel values!